As a result of interest being shown in de Havilland's D,H.60M “Metal Moth" as a cheap introduction to combative military operations, de Havilland built in November 1930 what they described as a "D.H.T. (Training) Moth". Essentially a D.H.60M with a de Havilland Gipsy II engine with an inverted fuel system, aircraft No 1672 was complete by December 5. Compared with the earliest civil versions the D.H.60T was strengthened to allow it to operate at a higher all-up weight, and it could also carry four 9-kg (20-lb) practice bombs under the fuselage. Following review, the company decided that it could be further improved; developed to Specification 15/31, anchorage of the front and rear lift wires was repositioned, allowing unhindered access onto the walkway and the root-ends of the upper mainplanes were cut away to improve the upward view. Designated as a D.H.60T Moth Trainer and registered G-ABKU on April 1, 1931, it was despatched to the Aeroplane & Armament Experimental Establishment (A&AEE) at Martlesham Heath under de Havilland's test marks E.3, but was dismantled in July and "reduced to redundant stock". Working with another airframe, the de Havilland team's new task to comply with the Air Ministry's requirements was to rearrange the geometry of the cabane structure. The forward shift of the centre section tank proved to be 18in measured at the wing root, and the trial installation was scrutinised by Geoffrey de Havilland and test pilot Hubert Broad, who was not totally convinced, with the result that the centre section was moved forward by a further 4in. The change in geometry solved the cockpit accessibility, but the aircraft was now seriously out of balance. The simplest and cheapest option was to sweep back all four wings, the degree determined after moving the interplane struts 9in forward of their original location, but it proved not to be sufficient. Further sweepback was added to the top wings alone until the centre of gravity (cg) conditions were considered to be satisfied. This precluded the ability to fold the wings, not a drawback for military operators but a major selling feature of all other Moths. On July 10, 1931, the aircraft was identified as a "D.H. Training Moth T1" fitted with a Gipsy II engine. 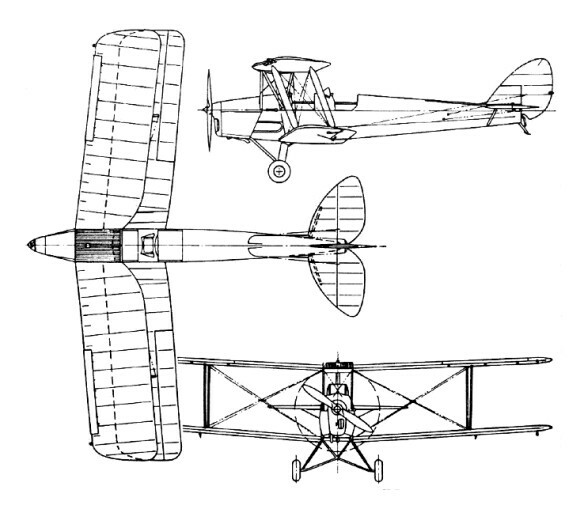 It is probable that the core of the T1 Moth was the former G-ABIKS, which, as E.4, was flown by Jack Tyler on July 21. E.4 never qualified for a C of A before it too was declared redundant and dismantled. To comply with another Air Ministry requirement, a prospective training aeroplane had to be given a name, one beginning with "T" (for Trainer), and de Havilland chose Tiger Moth. The decision to "invert" the Gipsy II engine was taken in 1929, the resultant Gipsy III offering the same horsepower but a much improved forward view and higher thrust-line. The first Trainer with the revised swept wings and a Gipsy III to be designated D.H.60T Tiger Moth was No 1726, registered G-ABNI on June 25, 1931. Sales Director Francis St Barbe was still concerned about prospects in Canada, and in August G-ABNI was despatched to Toronto. The second D.H.60T Tiger Moth, G-ABNJ, was delivered by Hubert Broad to Martlesham Heath on August 18 as E.5, and the general impression was favourable. In the opinion of test pilots, landing in a crosswind put the into wind wingtip perilously close to the ground and when taxying across uneven territory, any down-aileron could make contact with the surface. At de Havilland's factory, a third D.H.60T, G-ABPH, was re-rigged to accept 40deg 30sec of dihedral on the lower wings only, an increase of 1deg 45sec over the setting of the top mainplanes, solving the problems and the type was cleared in September as a prospective military trainer. Adding sweep to the constant chord wing changed the relationship between the angle of the ribs and the airflow, resulting in a less efficient section. The company viewed the prospect of modifying their jigs with some alarm. The RAF 15 (modified) wing profile had been carefully chosen but the company decided to make no immediate change to the design of the wing and never did. Eight aircraft were manufactured to the D.H.60T Tiger Moth specification. Following the delivery of G-ABNI to Canada, Hubert Broad flew G-ABNJ to Stockholm in December, where in appalling weather he demonstrated the open cockpit biplane over several days. It remained in Sweden, and was sold to the Flygvapen (Swedish air force) under the designation Sk 11. It was an important sale which led to further orders and licensed manufacture in Sweden. Tiger Moth G-ABPH was sold to de Havilland's Portuguese agent and the remaining five aircraft were all sold to China. The design department decided that sufficient major alterations had been embodied in the basic D.H.60 for a new Type Number to be applied to the Tiger Moth. This was not a hasty decision; a change usually signalled the need for a new Type Record to be established, a time consuming and expensive exercise. The next number was D.H.82, and interested parties were advised the price of the new aircraft was £1,045. The Air Ministry awarded a contract for a prototype D.H.82, c/n 1733, against a unique specification, 15/31. Painted silver, it was flown by Hubert Broad under B Conditions as E.6 (later registered G-ABRC) on October 26, 1931. An order had already been placed for a further 35 aircraft to specification 23/31, essentially the same as the build standard of No 1733. The D.H.82 Tiger Moth prototype, G-ABRC, first flown by Hubert Broad under B Conditions as 11 on October 26,1931. The aircraft survived until 1956 when it was broken up and burnt at Croydon. All Tiger Moths ordered by the Air Ministry were fitted with Handley Page automatic slats on delivery as part of the standard specification. The advertised cost of supplying and fitting slats early in 1932 was £18 with a further ten guineas required for a slot-locking device operable from the cockpit. An additional sum of £38 11s 6d was paid to Handley Page as a royalty on each set fitted. The first six of the RAF's D.H.82 Tiger Moths, K2567-K2572, were scheduled for delivery to No 3 Flying Training School (FTS) at Grantham on November 9, 1931, but owing to poor visibility the flight was postponed. Conditions improved sufficiently the following day and, leaving at 0945hr, the flight took 65min. In December 1932 K2578 arrived at Martlesham Heath to begin flutter trials, with the result that mass balance weights were recommended for the ailerons. In February 1933, K2570 joined the programme to investigate the inverted envelope and K2583 began trials on November 13, which resulted in a recommendation for mass balancing of the rudder. The improved Gipsy III engine was initially designated Gipsy IIIA, but the military connection was considered vital, and the name Gipsy Major was adopted for full production in 1932. Unprecedented for aero-engines of the period, the Gipsy Major 1 was introduced into service with an overhaul life of 450hr, a 50 per cent increase over the Gipsy 1 of 1927. By July 1933, it had risen to 750 hr and by August 1937 to the magic 1,000, but that was not the end. At the all-up weight of 1,8251b, maximum speeds were 109 m.p.h. at sea level reducing to 99 m.p.h. at 10,000ft, with a cruising speed of 93 m.p.h. and petrol consumption of six gallons per hour. With a fuel capacity of 18 gal, range was 279 miles. The new engine improved performance with a reduction by 17yd to achieve a take-off run of 156yd from a standing start to lift-off. For an aircraft designed primarily for circuit training, a service ceiling of 13,600ft might have seemed fairly academic, or an absolute value of 18,100ft, but de Havilland's main thrust early in 1933 was to promote the Tiger Moth as a multi-role military trainer in which bomb-aiming and photographic reconnaissance from such altitudes would have been normal operational practice. The opportunity was taken in the summer of 1932 to refine the airframe, The front fuselage side frames were redesigned and the fabric-covered hoop-and-stringer arrangement of the rear top decking was replaced with a single spruce and ply construction. New compression legs from Dowty replaced rubber blocks with coil springs. Further changes were made to the top wings to introduce a standard maximum aerobatic weight of 1,7501b. Space for an extra gallon was designed into the centre section fuel tank by rounding out the leading edge. First to take advantage of all the improvements was c/n 3148, supplied to the Ministry of War in Madrid at the end of 1932. The first Tiger Moth which incorporated all the airframe improvements and with a Gipsy Major engine was c/n 3175. Registered G-ACDA on February 6, 1933, this machine is acknowledged as the first definitive D.H.82A, one of a batch of ten for No 1 Elementary & Reserve Flying Training School (ERFTS). Two, with twin floats supplied by Short Brothers, were built to Specification T.6/33 for RAF evaluation at Rochester and Felixstowe. Aware of the need for economy in March 1934, the Air Ministry announced an order for 50 D.H.82A Tiger Moths, listed as Tiger Moth Mk IIs, to be delivered less engines to RAF Kenley between November 1934 and the following February, to Specification T.26/33. The aircraft were serialled K4242-K4291 and allocation was throughout the RAF, not as trainers, but to serve with squadrons and station flights, communications units, practice flights, and an army co-operation unit. Tiger Moth IIs had hoods which could be positioned over the rear cockpit for instrument flying instruction. 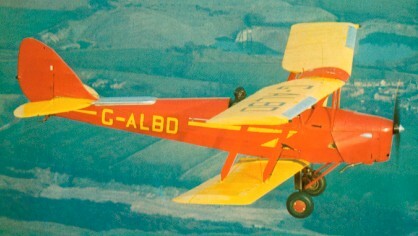 Others were supplied to the Bristol Aeroplane Company, the de Havilland School of Flying, Brooklands Aviation Ltd, Phillips and Powis School of Flying, Reid and Sigrist Ltd, Airwork Ltd and Scottish Aviation Ltd for the Elementary and Reserve Flying Schools which these companies operated under the RAF expansion scheme. 44 such schools were in operation in August 1939, although 20 of them closed when hostilities began. The most radical of all modifications resulted in the first Tiger Moth Fighter, Persian serial 122, unveiled in October 1932. Located in the front cockpit, a 0.30in-calibre machine gun was capable of delivering 900 rounds per minute. It was never clear whether this was a fighter trainer or a true fighting aircraft but the aircraft was deployed around the Persian oilfields at Abadan. The de Havilland company had resisted a substantial redesign of the Tiger Moth but by the end of 1934 found itself being shepherded in the wake of new RAF requirements. The most obvious was likely to be a more powerful engine, and the Gipsy Six was the natural candidate. Good take-off and climb performance was necessary while speed was of little consequence. The aircraft should have more spacious cockpits, facility for a manoeuvrable observer's gun to the rear and a synchronised forward firing machine gun. Early in January 1935, shortly before delivery of the 1,000th Gipsy Major engine, the de Havilland directors were divided on whether a bigger, all-purpose development was preferable to a modified version of the standard Tiger Moth, with the front fuselage adapted to provide more spacious cockpits and other refinements, while retaining the Gipsy Major. Hugh Buckingham reported from Sweden that the Tiger Moth had fallen into disfavour. Instructors believed it was too small and too easy to fly, and cramped cockpits were not compatible with a pilot in a winter flying suit. Nikolaus von Eltz, de Havilland's agent in Vienna, raised almost identical criticism. He had been advised by the Austrian air force that the D.H.82 was an old design: no longer were control cables run outside the fuselage and across a non-adjustable tailplane. The aircraft had no mainwheel brakes, nor a tailwheel, and was not very good at aerobatics. In April 1936, St Barbe admitted that had it not been for other major preoccupations the Tiger Moth would have been replaced some time previously. He considered it to be "on its last legs" and at the current price of £1,100, unlikely to attract orders. St Barbe cut the price to £850, a figure at which it could be produced at "no loss". By the end of 1936, the company was considering a three year plan in which design capacity would be allocated to a replacement, probably from April 1937. Orders continued in sufficient numbers to maintain the line, which was fortuitous as on May 27, 1938, the company was told that it would receive a contract from the Air Ministry for 400 Tiger Moths, the last to be delivered by September 30 the following year. At a required average monthly production rate of 25 aircraft, it would be difficult to fulfill the contract without assistance, so the Air Ministry agreed to allow de Havilland in Toronto to step in as a sub-contractor. In the interim, the Air Ministry placed an order in May 1938 for 50 and in June confirmed their order for an additional 400. In September, they ordered another 300. In 1939 the company prepared a scheme for a D.H.82B Tiger Moth incorporating remedies for all the major criticisms. The fuselage was widened by 4in and a larger fin and horn-balanced rudder were designed to provide inherent stability. Elevator trim tabs and horn balances were installed to improve aerodynamic fore-and-aft trim, replacing the previous crude but effective method of spring tensioning. tailwheel. An increased capacity fuel tank was planned plus an experimental powerplant, the Gipsy Major IIA which produced 160 b.h.p. at 2,500 r.p.m. On 17 September 1939, just two weeks after war had been declared, TV Flight of the British Expeditionary Force Communications Squadron (later No. 81 Squadron) was despatched to France. Throughout the winter and the following spring, the unit's Tiger Moths operated in northern France, providing communications facilities until the Dunkirk evacuation, when surviving aircraft were flown back to Britain. Preparations were also made for the Tiger Moth to be used in an offensive role, to combat the threatened German invasion. Racks designed to carry eight 9kg bombs were fitted under the rear cockpit or, more suitably, beneath the wings. Although some 1,500 sets of racks were made and distributed to the Flying Schools, 350 Tiger Moths were fitted and none were used operationally. Rather earlier, in December 1939, six coastal patrol squadrons were formed, five of them equipped with Tiger Moths. However futile this may seem, it was considered that despite an inability to attack, the sound of any engine might deter a U-boat commander from running on the surface and thus reduce his capacity to attack shipping. The 'paraslasher'; a scythe-like blade fitted to a Tiger Moth and intended to cut parachutist's canopies as they descended to earth. Flight tests proved the idea, but it was not officially adopted. The Tiger Moth 'human crop sprayer' used a tank fitted in the front cockpit with powder dispensers located under the wings. The tank would be filled with 'Paris Green', an extremely poisonous insecticide. It was intended that low flying aircraft would dust the German troops as they waded ashore. In the Far East a small number of Tiger Moths were converted for use as ambulance aircraft, the luggage locker lid being enlarged and a hinged lid cut into the rear fuselage decking, providing a compartment some 1.83m long which could accommodate one casualty. The outbreak of war saw civil machines impressed for RAF communications and training duties, and larger orders were placed. Little is known about the D.H.82B Tiger Moth, a designation often erroneously applied to the D.H.82 Queen Bee. One prototype was constructed, c/n 1989, and tested as E.11 in 1939. Improvements were considered worthwhile, but the more pressing need for high-volume production of a proven primary trainer overtook the need for refinement which brought the D.H.82B project to a premature end in 1940. The DH82B Queen Bee was built using the wooden Gipsy Moth fuselage and Tiger Moth flying surfaces, a wind-driven generator to provide electrical power, and a larger-capacity fuel tank, and was used as radio-controlled drone for gunnery practice. The prototype was flown manually on 5 January 1935, and 380 were possibly built subsequently. When war was declared on September 3, 1939, some 1,300 Tiger Moths had been built in eight years at Stag Lane and Hatfield, the latter delivering 660 in 1939 alone. The Air Council promised in October 1939 that de Havilland was to receive a contract for 2,000 Tiger Moths, and reservedly agreed that 1,000 could be sub-contracted to Morris Motors. In order for Hatfield to concentrate on its new Mosquito project the company agreed to an immediate and total transfer of all Tiger Moth production to Morris Motors at its Cowley, Oxford, factory. Some of Cowley's first efforts in the form of T7013 were the subject of critical analysis at Hatfield at the beginning of April 1940, which resulted in 67 observations worthy of comment. The Cowley Works' Superintendent had already caused some dismay among the de Havilland advance party in claiming that the assembly of an aircraft should be treated no differently from that of a motor vehicle. Perhaps the eventual smooth output of 3,210 Tiger Moths from Cowley vindicated this philosophy to some degree. The first Cowley-built aircraft was T7011, transferred by road to Witney and test flown by Guy Tucker on May 15, 1940. A further 18 aircraft flew from Witney while the aerodrome at Cowley was being improved before Tucker flew T7029, the first from home ground, on June 27. In a wartime trainer role the Tiger Moth equipped 28 Elementary Flying Training Schools in the UK, 25 in Canada (plus four Wireless Schools), 12 in Australia, four in Rhodesia (plus a Flying Instructors School), seven in South Africa, and two in India. After the war 22 Reserve Flying Schools and 18 University Air Squadrons flew Tiger Moths, most re-equipping with the de Havilland Chipmunk between 1950 and 1953. With the military training machine in top gear, the requirement for new Tiger Moths diminished from February 1944 and numbers of complete but dismantled aircraft were delivered by road into "purgatory stores" in and around Oxford. The last Tiger Moth constructed at Cowley was PG746, taken on charge on July 24, 1944. From June to October 1945, many stored aircraft were routed back to Cowley where they were customised, erected, test flown and delivered to RAF Maintenance Units at Aston Down, Colerne, Little Rissington and Llandow, before sale or gift-in-aid to overseas' air forces. Postwar, the RAF transferred many for civil and military use to Belgium, France and the Netherlands, but in the UK and elsewhere they became available in quantity on the civil market. In addition to obvious use as trainers, or for sport and pleasure, they found unexpected employment. Many gave valuable service in an agricultural duster/sprayer capacity, a role which proved to be of great importance to New Zealand. A number were the subject of conversion schemes, usually to provide enclosed accommodation. The most ambitious was that carried out by the British company Jackaroo Aircraft Ltd, which involved widening the fuselage to seat four passengers in side-by-side pairs; open cockpit and enclosed cabin variants were included in the 19 Thruxton Jackaroo conversions completed by the company in the period 1957-9. Tiger Moth NL985 had been in continuous military service from delivery in August 1944 until withdrawn from flying duties eight years later. Recategorised as an Instructional Airframe, 7015M, the aircraft was withdrawn to Colerne and there restored to operational configuration with a late wartime camouflage finish to become part of the Royal Air Force Exhibition Unit. Allocated to the new RAF Museum at Hendon, NL985 was moved onto the site in 1972 to permit final building work to continue around them. Unfortunately vandals breached poor security at the site and set fire to the Tiger Moth, which was burned out. The RAF, the world's biggest user of the type, now had no Tiger Moth at all and turned to the Royal Navy for assistance. 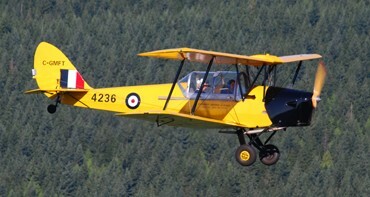 Tiger Moth T6296 had served with the RAF until December 1946 when it was transferred to the Admiralty and retired from flying activity at Yeovilton in September 1973. Painted in RAF brown and green camouflage, T6296 was presented to the Museum to fill the vacant space and in April 1990 was transferred to the Battle of Britain Hall. Each plane consists of two heavy I-section spruce spars with leading and trailing edge and ribs of normal wood structure. The tip bends are of light alloy tubing. The planes are internally braced by swaged rod and high-tensile steel wire completing a structure which is unaffected by any slight shrinkage which might take place in the spar. The interplane struts are of spruce with steel end sockets and the drag bracings are duplicated. Tubing to specification DTD 89A is used for round tubes in the construction of the fuselage, and DTD 113 for square tubes. Lower crossmembers terminating with fittings for root ends of the lower wings are especially constructed parts. The various stiffening plates at the welded joints are mild steel plate to specification S.3. The front fuselage, which is parallel in plan, is built of two flat sides welded and drilled in a jig, forming easily- replaceable units which are bolted to the crossmembers. The rear fuselage, from the rear of the pilot's seat to the sternpost, is a completely rigid welded-up unit, jigbuilt. The four longerons are of square tube; struts, diagonals and crossmembers are of round tube. A small quantity of 1/4in-diameter by 22 s.w.g. steel tubing is also used as stays for the rear fuselage fairing formers. The engine bay structure consists of two side frames, each made of three square tubes in triangular form, welded flat in a jig at the joints and assembled to the front fuselage by bolted fishplate. A stay tube braces the structure against side loads. The tail follows the normal de Havilland practice and is constructed of wood and fabric-covered. The control surfaces have trailing bends of light-alloy tubing. The tailplane is not adjustable in flight, but longitudinal trim is attained by an adjustable spring loading on the elevator circuit. The divided-axle undercarriage's sprung legs use rubber- in-compression. The top ends are attached to the fuselage lower longeron and the other ends to the wheel ends of the cranked half-axles, which terminate at a tripod fitting under the fuselage. The structure is completed by a forward-raked stay tube from the lower end of the leg casing to the fuselage. All control operating gear is housed in a control box running centrally along the cockpit floor, forming a unit which may be easily removed for periodic inspection. The controls in the front cockpit are detachable, the control columns by withdrawing a safety locking pin, and the rudder by removing the connecting rod. The two control columns connect with a shaft carrying a lever which transmits side movement to the ailerons by cables, and fore-and-aft movement by link tubes to a cross-shaft behind the pilot's seat, from which cables run to the elevator levers. Rudder cables run direct from the outer end of the rear rudder bar to the levers on the rudder. Norway proved to be a good customer for de Havilland products and the government-owned aircraft factory at Kjeller, near Oslo, negotiated a licence in February 1932 for production of 17 D.H.82s, for which British-built Gipsy III engines were supplied from Stag Lane. All 17 aircraft were completed by the summer of 1933 and before delivery the Norwegian Government allocated funds for the construction of a further 20 aircraft to be built as D.H.82As, to be known as Woth Majors". The Norwegian military was a strong proponent of the de Havilland philosophy of a "one-type trainer". In addition to a machine-gun-equipped operational trainer, the winter exercises in 1934 unveiled D.H.82 No 129 in the role of bomber with a rack of four under-fuselage bombs. The Swedish agent for de Havilland, Aero Material, placed an order with Stag Lane for delivery of a dozen D.H.82 Tiger Moths in June 1932, to be taken on Swedish air force charge as Type Sk 11. Three additional D.H.82s ordered by the Swedish military were built under licence by Aktiebolaget Svenska Jamvagsverkstadema (ASJIA) at Linkoping and delivered in March 1935. An order for ten D.H.82As, designated Sk 11A, was placed with ASJA for delivery in the summer of 1935, followed by ten more the following year. A number of improvements were designed by ASJA to cater for operations in all seasons. Pickup points for a float chassis were included as standard, and several aircraft were operated as seaplanes. Through the efforts of the de Havilland agent in Portugal, Carlos Bleck, the Portuguese Government purchased 23 Tiger Moths in December 1931, followed by 21 D.H.82As in 1933 and 1934. A further eight aircraft were delivered at the beginning of 1938, consigned to Oficinas Gerais de Material Aeronjutico (OGMA), the government aircraft factory at Alverca with whom de Havilland signed a licence agreement. Production at OGMA continued into the early 1940s eventually reaching a total of 91 aircraft. Following the arrival of D.H.60T Tiger Moth G-ABN1 in June 1931 it was not until August 1935 that de Havilland's Canadian company took delivery of a second Tiger Moth from England, a fully developed D.H.82A, locally registered as CF-AVG. Officials at the company's headquarters at Downsview were astonished to find that, like G-ABNI before it, 'AVG had been built to European standards and a sliding canopy was soon fitted. In this configuration it was widely demonstrated and although the new aircraft met all the criteria laid down by the Royal Canadian Air Force (RCAF), there was no budget to buy a single one. The lobbying of Ottawa and an offer to build the aircraft in Toronto resulted in the issue of specification C/11/36, and a contract for the supply of 28 Tiger Moths was signed on March 12, 1937. The order was for 27 new aircraft re-engineered locally to be known as type D.H.82A (Can) Tiger Moth. The demonstrator, CF-AVG, was included in the sale as the 28th aircraft, but was completely dismantled for use as a working pattern. The first new aircraft, RCAF 239, first flew on December 21, 1937, and was delivered to Trenton on January 18, 1938. de Havilland Aircraft of Canada prewar output included 227 D.H.82As. Having got production of the D.H.82A (Can) under way, the Downsview drawing office sought to add further refinements. A significant improvement was provided by new engine cowlings, the installation of cable-operated Bendix mainwheel brakes and a fully castoring tailwheel with a pneumatic tyre. Skis or floats could be fitted if required. A trim tab was set into the trailing edge of each elevator, capable of precision setting exercised from either cockpit. The improvements to the D.H.82A (Can) continued with the choice of the more powerful Gipsy Major 1C as standard engine and modifications to the canopy which would permit it to be jettisoned. The British Commonwealth Air Training Plan was announced on December 10, 1939, and in February 1940 de Havilland Aircraft of Canada Ltd received a government order to supply 404 Tiger Moths embodying all the modifications and improvements which had been authorised under specification AP/3/39. 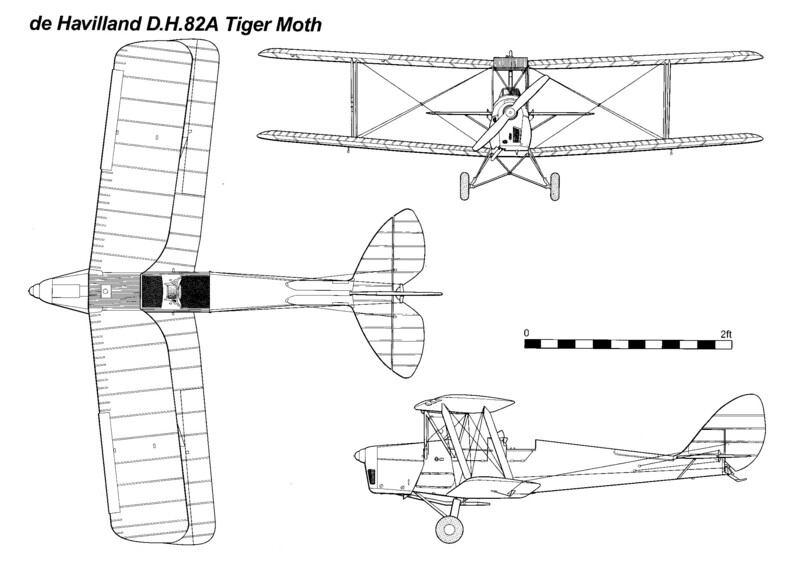 The new type designation was to be D.H.82C Tiger Moth. The first aircraft built to the specification, C331, was flown by Bruce Douglas on March 12, 1940, and was handed over to the RCAF on April 10. The continuing supply of engines from Stag Lane assured orders for another 428 D.H.82Cs, which were delivered progressively from April to December 1941. Until the submarine menace in the North Atlantic was finally neutralised the Canadian company realised how dangerous their engine supply situation could become. In the USA they sought, and found, an alternative powerplant - the D-4 Pirate engine designed and built by the Menasco Manufacturing Company of Los Angeles, California, physically similar and with a performance almost identical to the Gipsy Major IC. Air and groundcrew, however, needed to be aware that the propeller rotation was in the opposite direction from the Gipsy Major. The first installation (of a C-4 model) was made for test flying by Bruce Douglas to begin on June 30, 1940. Ten aircraft with Pirate engines ordered for delivery between May and June 1941 were re-designated as D.H.82C2s by de Havilland and as 'Wenasco Moths" by the RCAF. A second batch which entered service as wireless trainers in the first half of 1941 were designated D.H.82C4 (Menasco Moth II) and appeared ideally suited to the task on account of the engine-driven generator system. The rear cockpit was stripped and fitted with obsolescent wireless equipment. The aircraft were overloaded and underpowered, and all were replaced as soon as practicable. A Gipsy Major-powered wireless trainer designated D.H.82C3 was proposed, but never progressed beyond initial planning. Some 200 Tiger Moths manufactured under the Mutual Aid Program on behalf of the USA and scheduled for the United States Army Air Force (USAAF) as the PT-24 were never to wear Uncle Sam's colours. The whole consignment was donated to the Air Training Plan and carried the standard yellow-and -black trainer colours and serials of the RCAF. A further 350 D.H.82C Tiger Moths were delivered to the RCAF commencing on March 3, 1942 From April 1940 until September 1942, the factory at Downsview maintained an average output of 51 Tiger Moths per month, reaching a peak of 75 per month at the end of 1941. In total, 1,549 airframes were completed in addition to the fuselages sent to Hatfield. The first Tiger Moth received at de Havilland's works at Mascot Aerodrome near Sydney, VH-UTD, was not registered until May 1935, sold to the Newcastle Aero Club. However, on November 21, 1938, the Australian Air Board placed an order for 20 Tiger Moths, all to be constructed at Mascot at a total cost of £33,660. The contract allowed fuselages to be imported from England and these were despatched from Hatfield between January and March 1939. Wings and empennage were built at Mascot, where Stag Lane-built engines were installed. Murray Jones made the first test flight of A17-1 from Mascot on May 8, 1939, and the aircraft was delivered into RAAF charge at Richmond eight days later. An order for a further 350 Tiger Moths was placed on October 10, 1939. All were to be built locally using Gipsy Major engines manufactured in Australia under the terms of a licence held by the Commonwealth Aircraft Corporation (CAC) and, in January 1940, an order for 500 engines was placed with General Motors (Holden's) Ltd, a major shareholder in CAC. The first of 1,300 Holden's-built engines were installed in RAAF Tiger Moths at Mascot in December 1940. Delivery of the first Tiger Moth airframe to be wholly constructed in Australia was made on June 21, 1940, when A17-25 was taken on charge at No 2 Air Depot at Richmond. That same month de Havilland was authorised to order raw materials for a further 300 airframes. By December 31, 1940, Mascot had delivered 208 aircraft and production had reached ten Tiger Moths per week. Holden's was manufacturing engines at the rate of 40 per month. Tiger Moth production at Mascot was continuous from June 1940, reaching a peak of two aircraft per day by March 1941, until August 1942 when the line was halted. Eighteen aircraft originally scheduled for southern Africa were released from May 1942 for use by the USAAF in Australia pending delivery of their own communications types. In September 1944 the Mascot line was re-opened to provide a further 60 Tiger Moths at a cost of about £1,200 each. The new production was authorised in spite of an offer to supply Tiger Moths from the UK, where for some months already, Morris Motors had been delivering aircraft directly into store. By February 1945, 35 of the new Australian aircraft had been delivered, but the remainder of the order was cancelled on the grounds that the aircraft were simply not required. The Tiger Moth soon proved itself ideally suited to New Zealand's training requirements, and with an established base at Hobsonville offering service and support, the Royal New Zealand Air Force (RNZAF) decided it would standardise all its primary training needs on the type. Alan Butler, chairman of the company, announced on February 7, 1939, that a de Havilland Associated Company was to be established in Wellington and on May 24 construction of a new workshop was commenced at Rongotai aerodrome. At the beginning of August the New Zealand Government ordered 100 Tiger Moths at a total cost of £155,000, the last aircraft to be delivered by February 1941. To initiate the contract it was intended to import batches of partially assembled kits from Hatfield. The first aircraft recognised as having a significant local content, Stage A in a pre-planned six-part programme, was NZ762, taken on charge on July 18, 1940. By the implementation of Stage F, it was intended for the whole aircraft to be a product of the Wellington factory. This happy state was met by NZ811 which was subject to a 30min test flight by Hugh Buckingham on April 19, 1941. The provisioning programme began to run seriously behind schedule and in an effort to alleviate some of the shortfall, Australia agreed to supply component parts which were integrated into New Zealand production from March 1941, followed by the provision of 20 complete aircraft. The first RNZAF aircraft consisted of twenty-one impressed from eleven aero clubs, and three new aircraft about to be delivered to those civilian organisations. More British-built machines were received before the de Havilland factory at Rongotai began production. A further 36 Tiger Moths were ordered early in 1942 and had been delivered by November. In July 1943 another 36 were ordered but only 27 were delivered. A new contract was drawn up in February 1944 requiring 45 Tiger Moths to be delivered by December 3 of that year but only 18 were supplied. With a run-down in the training programme and a low attrition rate, the final 27 aircraft were cancelled. This factory produced 345 Tiger Moths for the RNZAF until production ceased in the mid-1940s. In New Zealand 110 were assembled from UK produced parts, 181 were built entirely. A number of modifications, mostly British in origin, were made to the NZ built Tigers. One was an enclosed canopy which appeared in two versions, a sliding model in 1943 for the Air Training Corps and a sideways hinged model in 1944. A fitting for the attachment of a Mk. 1 bomb carrier was made in January 1942, a standard RAF camouflage added in April 1942 and a ten gallon auxiliary fuel system introduced in September 1942 giving a four hour endurance. The “Tiger Bomber” was flown with the pilot in the front cockpit to keep the centre of gravity within limits when the eight 20 or 251b bombs were in position. A drastic nose down pitch followed bomb release. Four Light Bomber squadrons (Nos 41, 42, 43, 44) were formed and one Fighter Bomber squadron (No. 51). Canadian-built Fairchild Cornells were supplied to the Rhodesian Air Training Group (RATG) as Tiger Moth replacements from late 1943, and all Tigers with more than 2,000 airframe hours were scrapped; others were taken from open storage and ferried to South Africa. to flow through to the RATG, which on the advice of the Ministry of Aircraft Production in London suggested a minimum price of £500 each, as standing. Sealed offers for the first batch were opened on October 4, 1945, and resulted in 76 firm bids for 45 aircraft from 20 prospective clients, A similar exercise with a second batch of 37 aircraft resulted in 27 contracts. The 100 hand-picked Tiger Moths which arrived back in Rhodesia from South Africa at the end of 1946 were allocated to No 4 FTS at Heany and No 5 FTS at Thornhill. The second batch of 100 Tiger Moths was shipped from Cape Town into the care of the Hindustan Aircraft Company at Bangalore in India on behalf of the Indian Government. De Havilland manufactured 8,811 DH 82 Tiger Moths between 1931 and 1945. Between 1939 and 1945, de Havilland built 4,005 Tiger Moths in the United Kingdom and 1,747 in Canada. Moths would be released in quantity until a new RAF trainer was available “In a year or so". There was even a hint that training aircraft might be imported from the USA. Stocks of Tiger Moths in use or in store, it was admitted, as of March 1, 1945, amounted to 2,273. In January 1946 the Air Ministry advised that 100 RAF Tiger Moths in store, all lightly damaged, were now available for disposal due to the contraction of repair facilities, The Royal Aero Club purchased all 100 aircraft for £5,000 and handled resale to member organisations. The entry of de Havilland Canada's DHC-1 Chipmunk into service released more than 80 Tiger Moths onto the British register in 1951, but there were teething troubles with the new type. Based at Barton, No 2 Reserve Flying School re-equipped with Chipmunks in January 1951 but had converted back to Tiger Moths by the following December, maintaining the type until disbandment in February 1953. In 1953 RAF storage units were permitted to turn out their residual holdings of Tiger Moths and 380 aircraft were categorised as "Non-Effective Stock". The majority were offered for sale, and the public was invited to visit Cosford, Hullavington and Lyneham on August 18, 1953, to deposit bids on 222 aircraft. The Australian solution to its surplus aircraft situation was quite straightforward: if the aircraft was likely to qualify for a certificate of airworthiness it could be sold but if not, it was scrapped. The first 100 aircraft were offered for sale by public tender by the Commonwealth Disposals Commission in February 1945, and included a variety of types from Tiger Moths to flying boats. They decided that the maximum price for a Tiger should be £500, but administ and structure of the pricing policy was to be generous and flexible. The last ten RAAF Tiger Moths were not disposed of until January 9, 1957. Each civilian purchaser had to acknowledge that sale of the aircraft was conditional on their immediate availability for military requisition in times of national emergency. At the time of the Japanese surrender, the Royal New Zealand Air Force (RNZAF) had 232 Tiger Moths on strength. Peacetime RNZAF requirements indicated that about 180 could be declared surplus, and an initial list of 114 aircraft was provided for the War Assets Realisation Board. An additional 15 Tiger Moths were set aside for presentation to flying clubs as compensation for aircraft requisitioned at the beginning of the Second World War. Surplus stock was offered for tender, with fixed reserve prices ranging from £30 to £330, but when the list closed on December 9, 1946, only 20 aircraft had been sold. In October 1947 the Minister of Defence was prevailed upon to donate 42 Tiger Moths to the Royal New Zealand Aero Club. Although there was no purchase cost, £20 per aeroplane was charged for assembly and rigging ex-storage, plus 6d per mile air delivery by air force pilots. The RNZAF was the last of the Commonwealth air forces to operate Tiger Moths in the primary training role. Nine aircraft were sold by tender in 1955 and the final 11 by August 1956. Eight Air Depots (ADs) had been established in South Africa by August 1941, of which No 4 AD at Lyttelton was assigned the reception of Tiger Moths and Miles Masters. Between January and October 1941, 250 new aircraft were imported through Cape Town and a further 120 were imported from Australia. As a result of the wear of engine parts owing to hot, dry and dusty aerodrome surfaces, aircraft were fitted with air intake filters attached externally to the starboard side cowling. Also, a small wheel was fitted in place of the tailskid. From February 1946, 100 aircraft were selected by the SAAF for postwar service with the Central Flying School (CIFS) at Dunnottar, from where several were sold in August 1948 at £4 10s each. Some disposed of as scrap later appeared on the civil register. The CFS sold its last aircraft to the SAAF Aero Club in June 1956. From 1940 D.H.82C Tiger Moths were operational at 23 Canadian based Elementary Schools in addition to four Wireless Schools. Having taken delivery of 1,520 C models between April 1940 and September 1942, they were mostly replaced by June 1944 by Canadian-built Fairchild PT-26 Cornells. In 1945 Canada's War Assets Corporation took administrative charge of each aircraft: all Menasco engined Tiger Moths were scrapped except for a handful, as were others with high hours. The rest were sold off to aero clubs and often to new owners merely for the wheels and tyres and petrol in the tanks. Several of the 208 new production Tiger Moths sent from Great Britain in RAF markings to India during 1943 and 1944 adopted civil registrations on arrival and were operated by flying clubs on behalf of the Government of India. Although some Tiger Moth spares were manufactured in India, plans for production of 239 new Tiger Moths in Bombay were not proceeded with. Far from being a disposal centre, India became a net importer of Tiger Moths after the war, and there was much administrative tidying to arrange following Independence and Partition on August 15, 1947. Twenty civil aircraft which had been impressed and 41 ex-RAF aircraft were transferred to the Indian Air Force at the end of October. Seven ex-RAF aircraft were transferred to the Pakistan Air Force in September 1947, and a year later six more were added, all second hand civil aircraft sourced in Great Britain by dealers W. S. Shackleton, an appropriate manner in which to comply with some diplomatic nicety.